Please join us to celebrate the life of Brownie and take a stand against the epidemic of animal cruelty in our city. Brownie, a dog who was set ablaze and forced to endure immeasurable pain and suffering, has garnered national attention for his horrifying torture and eventual death. 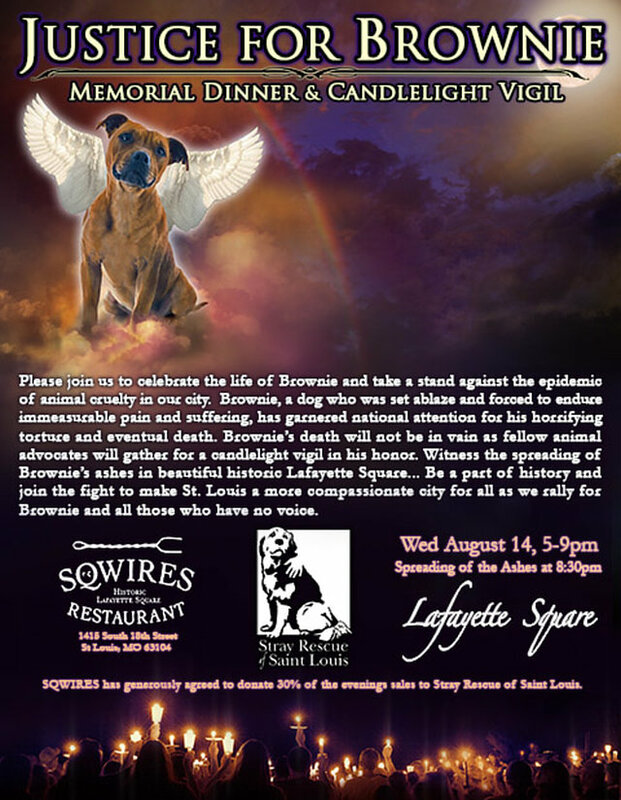 Brownie’s death will not be in vain as fellow animal advocates will gather for a candlelight vigil in his honor. Witness the spreading of Brownie’s ashes in beautiful historic Lafayette Square... Be a part of history and join the fight to make St. Louis a more compassionate city for all as we rally for Brownie and all those who have no voice. SQWIRES has generously agreed to donate 30% of the evenings sales to Stray Rescue of Saint Louis. Brownie lived his days on a short, heavy chain, and fell victim to a callous, abusive person.